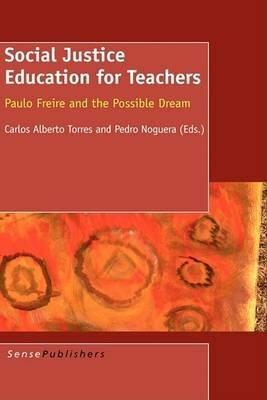 Social Justice Education for Teachers: Paulo Freire and the Possible Dream is a book that will help teachers in their commitment to and praxis of an education for social justice. The book traces the reception of Freire's ideas in the USA, Canada, Latin America, Europe, Asia, Africa, and Australia and provides some glimpses of topical yet seminal interventions in the philosophy of education, including studies of the relationships between Freire and Rousseau, Freire and Dewey, or Freire and Gramsci. In addition it addresses how Freire's ideas could be implemented in urban education, both in the industrialized and developing world, and how the debates about globalization today need to addressed also with the politics of liberation as a possible dream. Three of the authors, Moacir Gadotti, Carlos Alberto Torres, and Jose Eustaquio Romao with the help of Paulo Freire, created the first Paulo Freire Institute in Sao Paulo, Brazil in 1991, and worked very closely with Freire for more than two decades, while the remaining scholars/activist are noted Freirean scholars and urban educators devoting their research, teaching and political activism to promote tools of conviviality and models of policy that will make this a better world, a less ugly world, a world, in the words of Freire, where it will be easier to love.